We hope Londonist readers will have secured their tickets when we alerted them to "A Not So Silent Night", a Christmas musical entertainment hosted by the redoubtable Wainwright clan, back in May, especially if they enjoy a good sit down. 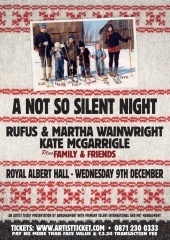 Many of the friends joining Rufus and Martha and their mum Kate McGarrigle at the Royal Albert Hall on Wednesday, December 9th, have now been announced and foremost amongst them are man of the moment Guy Garvey, lead singer of Mercury prize winners Elbow, and man of many outfits, the one and only Boy George. This immediately brought to Londonist's mind a gigantic festive singalong switching back and forth between "Feed the world!" and "One day like this a year would see me right! ", and in this event that might be one of the more likely pieces of teamwork as the stage fizzes with both elaborate and off the cuff collaborations between ever-changing combinations of performers bringing the audience a wide range of standards and surprises from the Yuletide repertoire. Also joining in, along with as yet unannounced guests, will be Janis Kelly (star of Rufus's recent opera), Ed Harcourt (whose "Hanging with the Wrong Crowd" is a favourite of ours), Jenni Muldaur (a former backing singer for Rufus and the likes of David Byrne and Eric Clapton, now forging a solo career), human beatbox Shlomo and assorted Thompsons including, but not limited to, Teddy, Kami (watch out for her show-stopping "Last Christmas") and Linda. The long running mutual appreciation between Rufus and comedy duo Dawn French and Jennifer Saunders will once more be revived into the bargain, though we'd offer decent money against the concert featuring their perennial party piece, "Between My Legs". The only tickets we could find on the official outlet were for standing room in the Gallery at the very tip top of the hall, but you may consider a little discomfort well worth enduring for such a heartwarming and fun one-off show. If you would like to go to the opposite extreme we believe that the VIP Packages are still available, which include great seats, entry to an intimate post-show cocktail with the performers, and unique gift bags. These packages can be obtained by making a donation of £500 to benefit cancer research through the Kate McGarrigle Fund via the details available here.